The PatriotWeb™ program was developed to assist in compliance with regulatory issues for Anti-Money Laundering (AML), Anti-Terrorism, the USA PATRIOT Act, Office of Foreign Assets Control (OFAC), Bank Secrecy Act (BSA), FinCEN 314(a), and other related domestic and foreign governmental regulatory requirements. The PatriotWeb™ program was designed to be installed over network and is best for one server with multiple client applications. This version serves best where your server is used as an internal Web server with each of your workstations utilizing Microsoft Internet Explorer (Browser) as a client to perform the single name search functions simply by using a URL you setup for them to access your server. 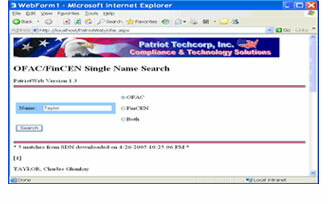 This version can be setup over an internal network and also over the Internet for multiple branch locations to access and provides the options to perform either OFAC SDN and OFAC PLC searches, FinCEN 314(a) searches or searches of OFAC SDN, OFAC PLC and FinCEN 314(a) entries simultaneously. In order to download a no-obligation, 10-day trial evaluation version of the PatriotWeb™ program, please submit your requests via the above listed contact reference point.